The 2014 Christianity Today Book Award Winner (Christian Living) Food is the source of endless angst and anxiety. We struggle with obesity and eating disorders. Reports of agricultural horror stories give us worries about whether our food is healthy, nutritious or justly produced. It's hard to know if our food is really good for us or for society. Our relationship with food is complicated to say the least. But God intended for us to delight in our food. 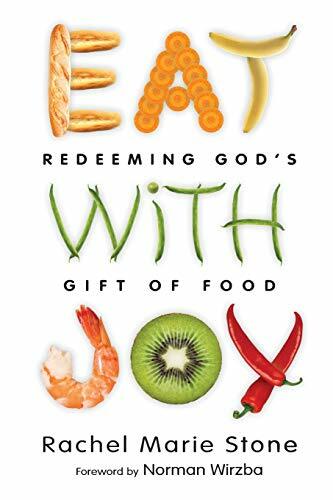 Rachel Stone calls us to rediscover joyful eating by receiving food as God's good gift of provision and care for us. She shows us how God intends for us to relate to him and each other through food, and how our meals can become expressions of generosity, community and love of neighbor. Eating together can bring healing to those with eating disorders, and we can make wise choices for sustainable agriculture. Ultimately, redemptive eating is a sacramental act of culture making through which we gratefully herald the feast of the kingdom of God. Filled with practical insights and some tasty recipes, this book provides a Christian journey into the delight of eating. Come to the table, partake of the Bread of Life and eat with joy."